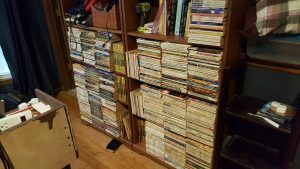 I have a decent sized collection of science fiction and fantasy magazines from the late 30s to the 70s. It may not look like much from here, but there’s a second layer behind each of these stacks. There’s about 700 of them, all told. And since I tend to keep my eyes open for new caches, I’m sure there’ll be more sooner or later. Anyway, I thought it would be fun to read one each week, picked basically at random, and then review it. Not only will I comment on the stories in each issue, but I’ll comment on ads and anything that catches my interest. Oh, one other thing. There will be spoilers. I am writing these with the expectation that few of you will ever get a chance to read most of the stories and I don’t want to leave you hanging. If I get enough comments that suggest you want me to leave the spoilers out, I will, but for now, consider yourself warned. 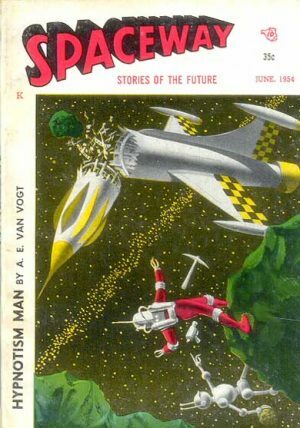 The first magazine I grabbed was the June, 1954 issue of Spaceway (Volume 2, Number 1). Here is the table of contents and complete list of credits for this issue: http://www.isfdb.org/cgi-bin/pl.cgi?203789. 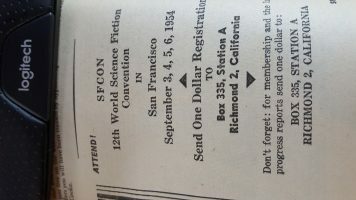 Spaceway‘s entry in the Encyclopedia of Science Ficton is here: http://www.sf-encyclopedia.com/entry/spaceway. As you’ll see from this page, Spaceway was a minor magazine which held few works by big name authors. Still, there might be a treasure or two. Let’s find out. It begins with a novelette, X of Mizar by Arthur J. Burks. Burks was an interesting guy who left the Marine Corps in 1928 to write full time. 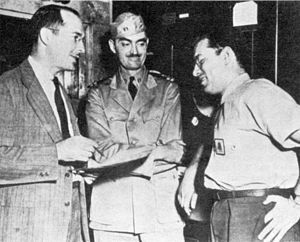 He returned to the USMC during World War II, rising to the rank of Lt. Colonel. In terms of his writing, he was prolific enough to earn the title of the Speed-King of Fiction by one reviewer. X of Mizar is a creepy tale about a world that’s a living creature in itself. Not only that, it’s much more powerful than humanity. The closest analogy to me is Q from ST:TNG. Unfortunately, I didn’t care for this story. It started with all of the arrogance of Q, but there was little comeuppance. In fact, there was little in the way of conflict. It’s disappointing, because this story had a ton of potential, but was little more than a character’s internal monologue. Next was The Green Earth Forever by Christopher Monig. Monig was actually a pen name used by Kendell Foster Crossen, who is best known for the Green Lama series. This particular story is a gloomy look at nuclear holocaust. Humanity is pushed to into a holocaust so great it destroys Earth by the species who has been watching us from flying saucers. It’s another disappointment, sadly, as it’s really just a series of events and then the Earth blows up. That is followed by an essay on hypnotism by A.E. van Vogt. This is clearly part of the research he did while writing The Hypnotism Handbook. Much of this essay praises the research and work of Charles Edward Cooke, who was his co-author on the larger book. There’s an ad for the book later on in the magazine. 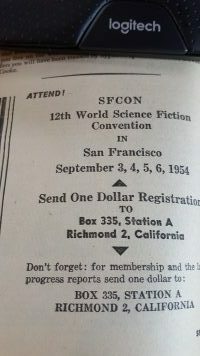 The essay wasn’t terribly interesting to me, but the ad for SFCon in 1954 at the end was fun. Take a look at the registration price. Anyway, the next story is The Human Thing To Do by Kinsley McWhorter, Jr. I know absolutely nothing about McWhorter. 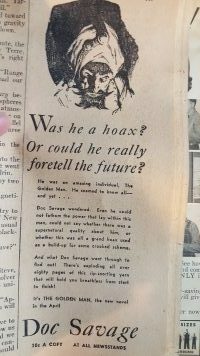 A Google search says he had a column in the Roanoke World News, and here’s a reprint of one in the Biloxi Daily Herald: https://newspaperarchive.com/biloxi-daily-herald-jun-09-1955-p-13/. And it’s too bad he didn’t write more because this was a fun story. The world has been invaded by a species of, essentially, dopplegangers called Galol. They take over people and no physical study can determine if someone is human or Galol. Once inside people, they serve as a Fifth Column. The solution, therefore, is to find what makes humans have a human personality. To McWhorter, the answer is our sense of humor. I also love the conclusion. Let’s see. Have a sense of humor or you get shot. Yeah, I’d be smiling too. Melvin Sturgis wrote the next story, The Long Night. Again, I can find little about Sturgis, though I did find that he wrote a novel called The Unprotected Species. One of its reviewers said it was, “OK but not outstanding. Somewhat predictable.” To be honest, I felt the same about The Long Night, at least in terms of predictability. It’s a very short story (less than 3 pages) where radioactive smog covers Los Angeles after a nuclear war. Humans have to flee the smog, but rats survive, evolve, and then view the remains of LA in wonder at humanity’s stupidity. More of an info dump than a story. Atlantis Hallam is the next listed author. What a name! Gotta be a pseudonym, right? That’s just too perfect for a science fiction writer. Well, it’s not entirely, as the author’s full name is Samuel Benoni Atlantis Hallam and he wrote Star Ship on Saddle Mountain. His entry in Spaceway was a treasure called Martian Pete. It’s a very cute story where the spokesdog of Wooftie Biscuits flees after having an ‘accident’ on live TV. A crewman on a ship heading to Mars gathers him in and takes him to the Red Planet. Pete meets and, after woofing and snapping, befriends one of the local rooks. When Pete is discovered, he is sent back to Earth. The rook decides to stick with his buddy, meaning the crewman is going to be in trouble again, this time for carrying an unregistered animal from Mars to Earth. Fortunately, Colonel Willoughby, the sponsor of Wooftie Biscuits, has missed Pete and it’s a happy ending as he takes them all back. Pure fluff, but impossible not to enjoy. Spaceway was Forrest J. Ackerman’s baby so it’s not a surprise to see an entry here. He reviews the movie Gog, third in the Office of Scientific Investigation (OSI) trilogy of movies by Ivan Tors, following The Magnetic Monster (1953) and Riders to the Stars (1954). Ackerman really loves the movie, and now I want to see it. Unfortunately, while Magnetic Monster and Gog are available on DVD, I haven’t found Riders to the Stars. Still, they look good. Next is The Plague by Albert Hernhunter, whose name is actually Albert Hernhuter. As a guy who grew up loving the 1980s Robin of Sherwood series, I heartily approve of this subtle change. However, the Plague is a story that has only one saving grace: it’s short with only 3 pages. Basically, it says that humanity tries to destroy another race with a bioweapon, only to find out the bioweapon saves that race from an already existing plague and to then have the plan backfire and destroy humanity. Not my cup of tea, and entirely predictable. The second novelette is The Uncompromising People by Jim Harmon. Harmon, too, is an interesting guy, known at one time as Mr. Nostalgia. He was also a good writer. I rather enjoyed The Uncompromising People and it had seeds that might very well have influenced other writers. The story is that Calvin Thomas Moss is a throwback to a sneakier time. He is a conman, a thief, and all-around scoundrel in a time when people have become more honest. That means that he is useful to those in power who need those skills, and once he got caught for a scheme, he was under their thumb. Facing awful sorts of imprisonment, he ‘agrees’ to go to Vega to help discover why their number of registered voters is decreasing. This is odd because the Vegans, while similar to humans in size and shape, evolved from a rabbit analogue with all the same reproduction rates. Also, they are albinos who aren’t exposed to as much ultraviolet light. Anyway, they believe that not registering to vote is a capital crime. It’s important because manipulating these votes allow the Galactic Federation of Earth to remain in power. So he gets sent in a rocket that has a computer to help him along the way. And a nuclear warhead to make sure he actually goes to Vega and does his job. What’s fascinating is that the computer is neurotic just like Marvin the Paranoid Android. Here’s one quote: “‘Go on,’ said the brain. ‘Shut me off. Leave me lifeless, now that I’ve served my purpose, now that you’re through with me…'” (p. 95). I can even hear that in Alan Rickman’s voice from the last Hitchhiker’s movie. It’s so close it makes me wonder if Douglas Adams read this novelette. But it’s not just that. The story has the same feel as Keith Laumer’s Retief stories. The only real difference is that Retief is never out of control of the situation and Moss is rarely in control until the climactic scene. Admittedly, that’s a big difference in storytelling, but it’s still got that same sly sense of humor and twist. The answer, by the way, to the population dilemma is that the female Vegans have been impregnating themselves purposefully, meaning they only have daughters. Since only male Vegans are allowed to vote that means the number of voters is decreasing, while the population is expanding. He tries to report back, but is halted by the paranoid rocket ship, which doesn’t believe that he knows the answer. While they argue, the Vegans catch up to him and are about to kill him, but he uses a Retief-esque trick. He convinces them that he has a secret hidden under his toupee, which requires a great deal of work including a special type of light to remove. He doesn’t have a toupee of course, but this gives him a chance to hit the albino Vegans with ultraviolet light, driving them away. Then, just as expected, he gets his comeuppance. Just because he succeeded at this mission doesn’t mean he’s out of hot water with the powers that be. Nope, it means he’s more valuable. I don’t know if Harmon wrote other stories with Moss, but I do hope so. 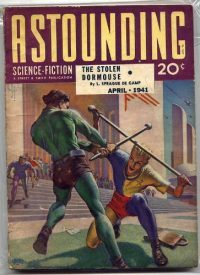 And, like Adams, I wonder if Laumer read this story. The next story is Pearls of Parida by Alma Hill. 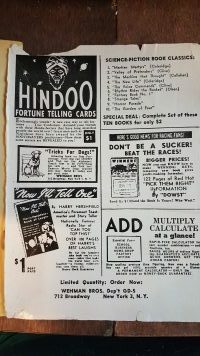 Hill was not terribly prolific, but she edited a number of fanzines. This is another story that’s short, only 7 pages or so, and in this case needed to be longer. It could have been interesting, but ends up as just a shoot-em-up battle scene. The last story, One Out of Many, is by Mark Pines. This is the only bibliographic entry for him in the Speculative Fiction Database. The story is of an archaeological expedition to a desert planet. At the end we discover that these are some other species and they are examining earth, as shown by the discovery of a small metal disc that says “E Pluribus Unum.” This is another story that could be really good, but seems curtailed. Not enough tension. It has a Randall Garrett sort of idea, but not Garrett’s skill at tricking the reader. That’s the last story, but not the last bit of fun. 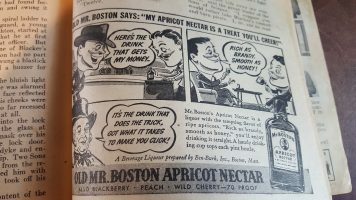 I always enjoy looking at the strange ads at the back of old magazines, and you can expect me to show them in most of these entries. One interesting thing I learned came from looking at these addresses. Notice anything missing? For some reason I thought Zip Codes were in use prior to 1963, but that’s when they officially came into being. This is also when the two-letter state codes came into existence. You all probably knew all this long ago, but it was new to me. Overall, this was not a great collection of stories. I would give it a 3 on a scale of 10. None of the stories had enough conflict or tension, though I enjoyed a few of them. I might raise it to 3.5 if I really love Gog and the Magnetic Monster. Despite the fact that this will not be my favorite in my collection, I really enjoyed the exercise. I’ve been wanting to go through these for some time because I know there are all sorts of cool things in them. I also can already tell it will spur some fun ideas.